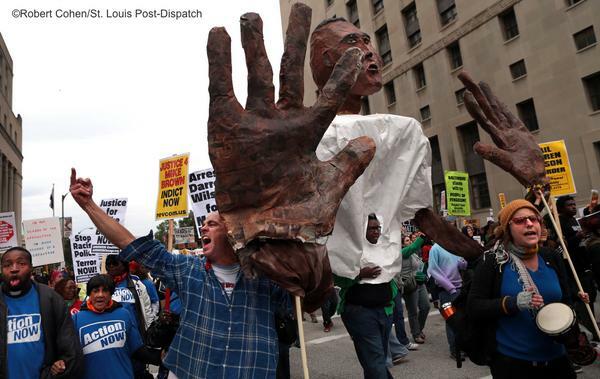 In the last half of 2014, protests against police brutality and entrenched racist policies in the United States made their mark across the country. Over the airways, in the streets and across digital media young black artists and cultural workers from the epicenter of the #BlackLivesMatter protests in Ferguson led the way with a myriad of creative responses. This shouldn’t be a surprise, since writers, painters, musicians, dancers and sculptors have frequently served societies by envisioning an alternative path, a previously undescribed landscape, a future potential. These visions can be mythical or reality-based, offering compelling hope and beauty. Their often relatively simple and nonviolent origins can tap an immense visceral power. Creative resistance also offers an outlet for rage that can be constructive, healing and positive, rather than destructive and escalating. In this day and age of cynical corporate media, creative protest can be “media-genic,” attracting even mainstream coverage of issues and delivering progressive framing if done well. 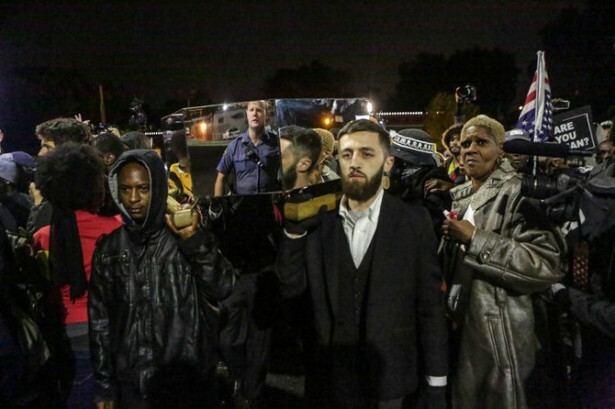 Throughout 2014, cultural workers in Ferguson and other cities responded to the shooting death of Michael Brown in a stunning diversity of ways. Though some are “new” ideas, and some tried and true, when viewed as pieces of a whole they read as an iconic spectrum of creative topical protest methods. In honor of the outpouring of poetic resistance techniques in the face of tremendous risk, overwhelming institutionalized violence and continuing murders, here is a look at some of the arts of protest from the anti-racism, anti-police-brutality movement whose black and young leaders continue to show up with no sign of slowing down in 2015. Local St. Louis painter, sculptor, videographer and recording studio artist Damon Davis has been making work about social inequality in his hometown since before the killing of Michael Brown. 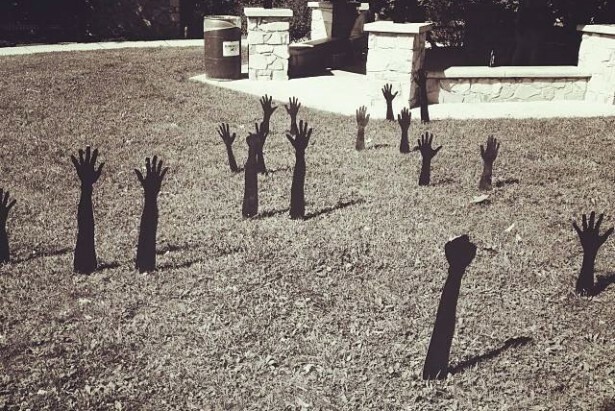 After the protests started, in partnership with fellow artists Basil Kincaid, he started “Hands Up” installations — painted plywood hands, reaching up from the ground, planted along main streets in Ferguson. Reportedly they were originally going to be half-buried mannequins, but that was too much trouble. Even two dimensional, these are provocative sculptures eerily rising from the ground, evoking the reported stance of Michael Brown just before he was fatally shot. In the fall, Davis took this idea in another direction. The “All Hands On Deck” project was created as a way to both add beauty to a newly boarded-up city and also represent the human dimension of support that was needed, and was being offered, from the broader community. He enlarged black and white digital photographs of raised hands from people in the movement and wheat pasted the hands-up images, with approval, on many of the plywood-covered store fronts. “This is a problem that is going to take everyone to fix,” said Davis. “It is all hands on deck.” Called “the most powerful street art in America” by Policy Mic, the more than life-sized up-stretched arms transformed the boarded-up windows from ominous to artful. They rise to document and honor those doing the work, as well as to inspire others to become active. Most activists are familiar with the tactic of using mirrors held up to your target or the authorities as part of a demonstration. Looking into the mirror police see themselves reflected back from among the protesters and any actions they take are on display, perhaps moving them to temper their own behavior. 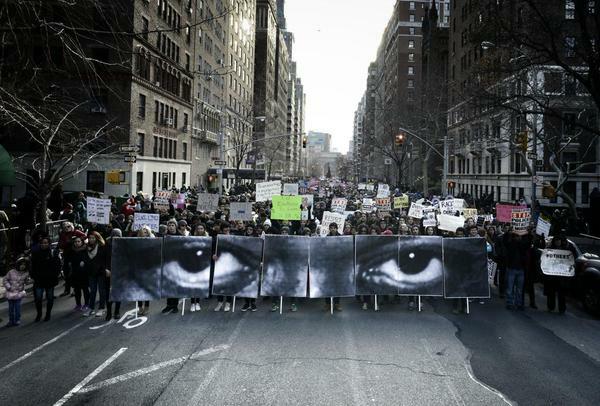 One of the most visually impactful images from the Millions March in New York City on December 13 were enlarged photographs of eyes carried on placards by groups of eight people across the march. These enlarged tiled images were created from photos of the eyes of Eric Garner and other past victims of police brutality. Given the cultural significance of looking into another eye’s in the United States and many places in the world, this was a forceful statement. Not only is there power in the oversized simple and human image, but eyes are believed by some to be an entry point into someone’s soul; if you can look someone in the eyes you have the potential to communicate honestly, to see yourself in the other. It is also commonly said that in order to believe something you must see it with your own eyes. The crowds across the country that have been marching and taking action have seen with their own eyes the violent police response to peaceful protest, which has fueled continued resistance. As the eyes of the world watch what happens in Ferguson and across the United States, the enlarged eyes of Eric Garner and other young black men peer back from the demonstrations waiting to see eye to eye. The eyes were created by Parisian artist JR who started his work as a graffiti artist; he is now well-known for other compelling projects featuring large-scale images in unexpected locations — ballerinas on shipping containers, huge photos of faces of women on a hillside favela in Brazil, and more. Public outlines of bodies have been a graphic activist tool wielded to make the invisible visible for decades. Traced outlines of female silhouettes as well as stenciled bodies large and small have been painted on sidewalks and park pathways, as memorials to rapes, nuclear bomb explosions, and other violent crimes that are difficult to talk about and often pushed out of public view. In 2014, #ChalkUnarmed formed as a way to keep the issue of police brutality in the public eye and offer an accessible project for many to plug into. It also created a way to link the narrative of Michael Brown to police violence-related deaths in other cities. Chalk tagging is less permanent than paint, less likely to be considered criminal, and easy to use to make a statement. 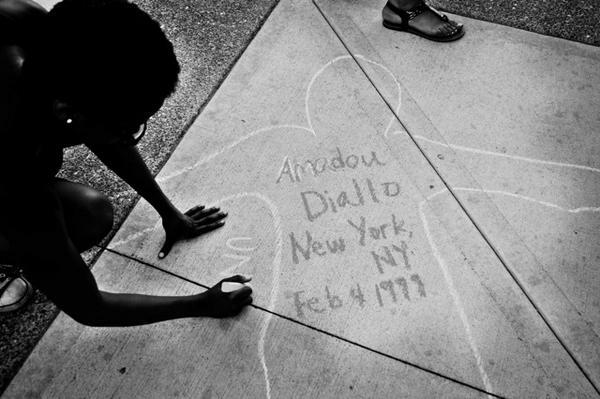 The project Chalk Against Police Brutality predates Ferguson, and supports the expanded use of chalk tagging to keep the public informed and focused on the epidemic of racial profiling and police brutality. The use of ephemeral, light weight chalk also speaks to the vulnerability the activists feel in taking the risks to create these silhouettes. St. Louis Public Radio recorded an interview with a couple of #ChalkUnarmed taggers as they covered the sidewalk outside their offices. “I’ve always been interested in using art to engage the public and get people involved in things that I think are important,” Mallory Nezam reported. She is a public space performance artist, and noted that the chalking started through an “organic and collaborative process … with a conversation about performance … someone lays down on the sidewalk, and we trace them, and then write the name of unarmed black men who have been killed by police.” With the hashtag and a Facebook page, the digitally-collected images become a scrapbook of the communities and people who have not only been affected by police killings, but have also committed to education and activism to make change. One artist in Washington, D.C., was looking for a way to turn religious icons and secular winter images in public spaces on its head and make a statement about police brutality. Omolara Williams McCallister went public with her first activist art project in a big way, as a team of volunteers put up more than 1,100 cardboard ornaments in red, green and black across Washington alone. Ornaments were made in many cities across the United States, all stenciled with #BlackLivesMatter, and zip-tied in public places. The #SolidariTrees #ConsciousXmas were used to tag photos online so that she could monitor the project’s reach. Such a low risk and fun activity recruited many previously unengaged supporters, and can provide a long-term way to stay involved. The poetic resistance above represents just a glimpse at the artistic tactics that have been used across the nation. A massive online media presence was built on viral hashtags, including #BlackLivesMatter (created in 2012 as a response to Trayvon Martin’s murder), #ICantBreathe and #HandsUpDontShoot, along with the distribution of poetry (check out the “Ransom Poett”) and posters and paintings that accompanied actions or stood on their own (Patrick Campbell’s gut-wrenching “New Age of Slavery” and Shirin-Banou Barghi’s Last Word images). The sound track of the movement was played by new and established artists including Tef Poe (“War Cry”), J Cole (“Be Free”), and Lil Herb with a remix of “Fight Or Flight” featuring Common and Chance The Rapper. On the street, call and response chants, some based on historical writings, including Assata Shakur’s 1973 “Letter To My People,” mixed it up with the harmonies of “I Can’t Breathe” from the Peace Poets. 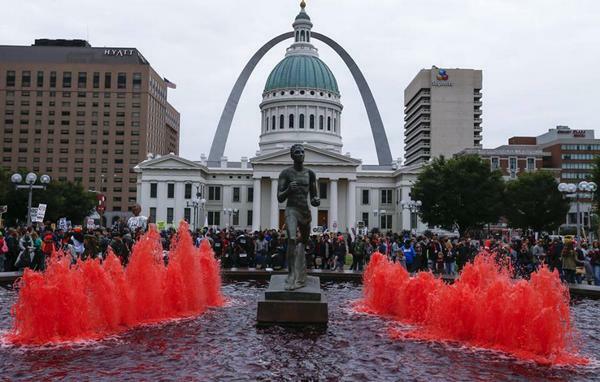 And yes, there have also been flash mobs, coordinated movement, and pop up performances like the Requiem for Mike Brown, street theater at the Philadelphia LOVE sculpture, and celebrities walking with #HandsUp; plenty of graffiti, emblematic giant paper mache puppets and even a St. Louis fountain running blood red — a fluid culture-jacking of an (un)timely tribute to the Cardinals. Another timely commercial movie release, “Dear White People,” spawned the “Racism Insurance Spoof” — a sidesplitting eye opener about white privlege and racism (although it is not so great on sexism). One of the keys to successful nonviolent movements is innovation — particularly in tactics. Effective innovation is usually the result of planning; planning allows a movement to be creative and continue to broaden its impact. As the #BlackLivesMatter movement develops, the need for strong and communicative actions will continue to grow, as will the need to increase the numbers of those involved. Harnessing the arts can be as visceral as blocking a highway, and much more accessible to the general public. 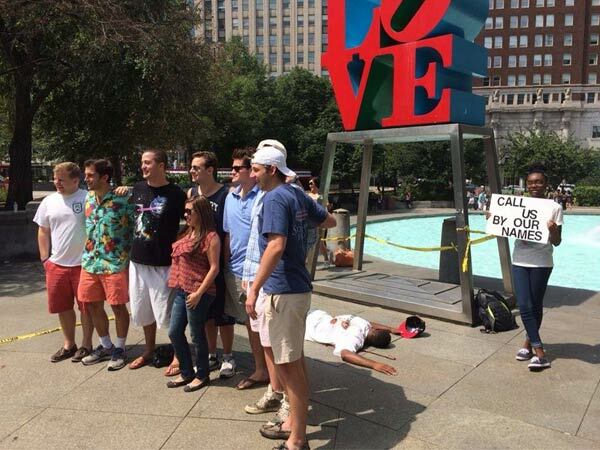 The new activism seems laid back. I think this is most effective. Sometimes activism has an “edge” to it, which can get people’s attention; precisely because it is disconcerting, though, it is also off-putting. Calm, almost passive, activism, draws in the uninvolved, leaving them almost “hungry” to learn more. It’s like soft-sell vs. hard-sell. Since many people in America are open to learning about injustice, there’s no need to hit them over the head, literally or figuratively. It also leaves the police with a good feeling. Cops like facilitating free speech. That’s been my experience with them. Makes their job interesting, and it’s why they joined the force: to help people.